A cairn commemorates the naming of Port King (Port Phillip) by Lieutenant John Murray and the hoisting the new Union Jack flag in Australia for the first time. European visitation of the bay dates back to 1802 when Lieutenant Murray spent over three weeks exploring its features. 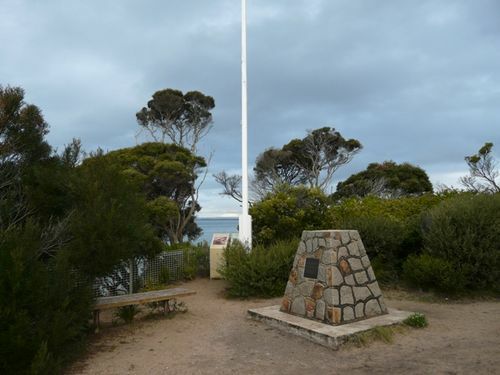 At the Flinders Shire Council meeting held at Dromana last Wednesday a letter was received from the Historical Society following on inquiries made by Council regarding the erection of a memorial cairn at Point King, Portsea. Back in 1926 the matter came before the municipality, and the Historical Society was also deeply interested, so much so that a member of the organisation offered to pay for the cost of a suitable plaque. Cr. Macfarlan told our representative that in Pt. King the Peninsula had a most historic spot, because back in 1802 Lieut. Murray and a party of Marines went ashore there, hoisted the British flag, and then took possession of Southern Australia for the British Crown. Flinders Shire is particularly keen to see the locality marked with a cairn and the engineer is to prepare a design. The Historical Society suggests that the cairn be about six feet square at the base, built in the form of a pyramid about 10 or 12 feet high, with a small plaque about two feet high and two feet six inches wide. Probably at later date, we will see a similar cairn erected at the site of the first settlement at Sorrento. Standard (Frankston), 10 April 1947. A granite memorial cairn to commemorate the landing by Lieutenant John Murray at Point King. Sorrento, on March 8, 1802, will be officially unveiled at 2.30 p.m. on Saturday. R.A.N, personnel from Flinders Naval Depot will re-enact the landing. They will come ashore from a corvette and raise the Union Jack. The Age (Melbourne), 8 March 1952. And Hoisted The Union Jack. Union flag here on 8 March 1802.
by the Lieutenant Governor of Victoria, Lady Southey, A.M.
to commemorate the bicentenary of the event.